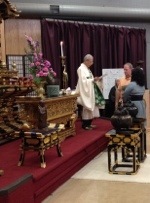 Today at the Buddhist Temple of Chicago Rev Nakai gave a talk and during this talk she said a phrase. The phrase was “stick of Buddhism” and it hit me, well like a stick. It reminded of a discussion with my wife about how the path of a Buddhist is not an easy one and it is easy to just settle into complacency and not delve into your own psyche and short comings. I remember reading stories where the Zen Master would hit students with a stick, not to punish them but to jolt them into a new awareness. So the next time you are stuck try and find a way to jolt yourself out of your mental myopia. As I approach my surgery date I plan on living each day as mindful as I can up until the anesthesia alters my awareness. During past surgeries I have memories of talking during the surgery, hearing conversations and even smelling things in the OR. I hope that this time, since I have been meditating more perhaps I can be more lucid and experience new things while my body is repaired. Stay tuned to see what happens. centuries ago. Shinji Ogawa notes that Issa is punning in this haiku. Today while at the International Buddhist festival I ran into my first dharma teacher Dr. Siruban Boonshoo from the Wat Dharam. It was a pleasure and a surprise the see him again. When the Siddhartha was born he was simply human. When he reached enlightenment he was STILL human. The title Buddha is a descriptor of a state of being. It contains two aspects: “accomplished one” and “awakened one” they mean that he removed all defilements and attained knowledge. How do we get to that state? Now try and realize that your own Buddha nature is like that beacon within yourself. This too can guide you through your own storms. Yesterday was a special day for my family. We observed Hatsu Mairi. This is the equivalent to a baptism or confirmation in christian churches. Our family waited until our daughter was old enough to participate in the decision. We chose the age of eight as she entered, according to current psychological understanding, the age of reason. 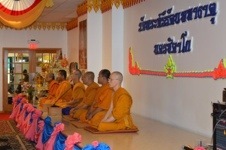 It was a very lovely service and also confirmed our families commitment to the Buddhist path. Another item that made it special was that our oldest daughter played the piano during the service.